The wildlife garden in January. It’s hard to imagine the discomfort experienced by wildlife and birds trying to survive on what’s left over in the garden after a long, hot summer, followed by a long, cold winter. Even with the good fortune of fairly mild weather – there may not be much food around for hungry mouths. With nesting season only a couple of months away, now is a good time to feed high-energy, fatty foods for birds to help them last the cold season and build their strength for Spring. Other animals that come out of hiding on milder days, looking for an energy boost to help them survive the cold nights, would benefit from a few morsels left out. Many urban and semi-rural gardens are homes to hedgehogs, foxes, badgers, birds, squirrels plus a host of smaller mammals and mini-beasts. Gardens close to specific wildlife habitats, such as woodland, might be visited by other wildlife, like deer, if the garden is accessible. All garden wildlife needs water to drink – keeping bowls and ponds accessible by clearing a space in ice is often overlooked during particularly cold times but an essential activity in maintaining an active wildlife garden. There might be small areas tucked away around the garden, which may provide suitable hideaways and cosy dens; a log pile at the end of the garden, access to undergrowth and hedging, plus some bird boxes, bat houses, bug hotels and butterfly houses should help keep the wildlife garden visitors safer and more comfortable until the better weather comes along. 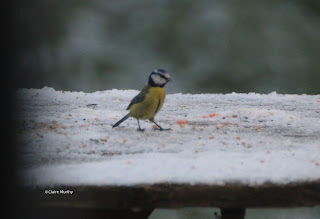 Wildlife garden blog : January.